At KidKnits, most of our attention is appropriately placed on our yarn, and the artisans in Rwanda and Chile that work to produce it. However, today we wanted to introduce you to another group of artisans that produce a very important part of the KidKnits craft kit. Meet Lilian, from Uhunzi. Uhunzi is located in Nairobi, Kenya and they make the KidKnits aluminum logo tag which is included in each kit. Uhunzi is all about using recycled materials and the process that they use to make each tag is amazing. The tags start as trash – aluminum cans in the slums of Nairobi. 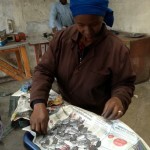 People who collect the aluminum cans sell them to Uhunzi, and can make a living doing so! Once they have the cans, Uhunzi melts them using recycled engine oil as fuel. They are cast in molds made from recycled sand from glass factories. Each tag then goes into the time consuming etching and polishing process before it comes to us as a finished KidKnits logo tag! Lilian is one of seven workers at Uhunzi and is one of two women on the team. She works at Uhunzi so that her children can get an education. So, keep in mind that with each KidKnits kit purchased, you are not only helping to support the women spinning yarn in Rwanda or Chile, but also Lillian and her co-workers in Kenya!